Whether it’s the satisfying sound of aluminum cracking, carbonation bubbles popping on the top of your lip, or the sweet taste as you start sipping, customers have an emotional connection to the iconic red-and-white Coca-Cola can. As more and more data become available about how businesses connect with customers, it’s apparent the emotional bond companies form with consumers is one of the biggest keys to creating a lifetime customer. Understanding how customers form these connections and the companies that were the most successful at building them will better equip your business to forge similar relationships. This knowledge not only sharpens your messaging, but it can lead to happier consumers who might pay more for the privilege of using your products or services. Read our exclusive brand loyalty research to see how you can strengthen the emotional bond between you and consumers through their insights and feedback. 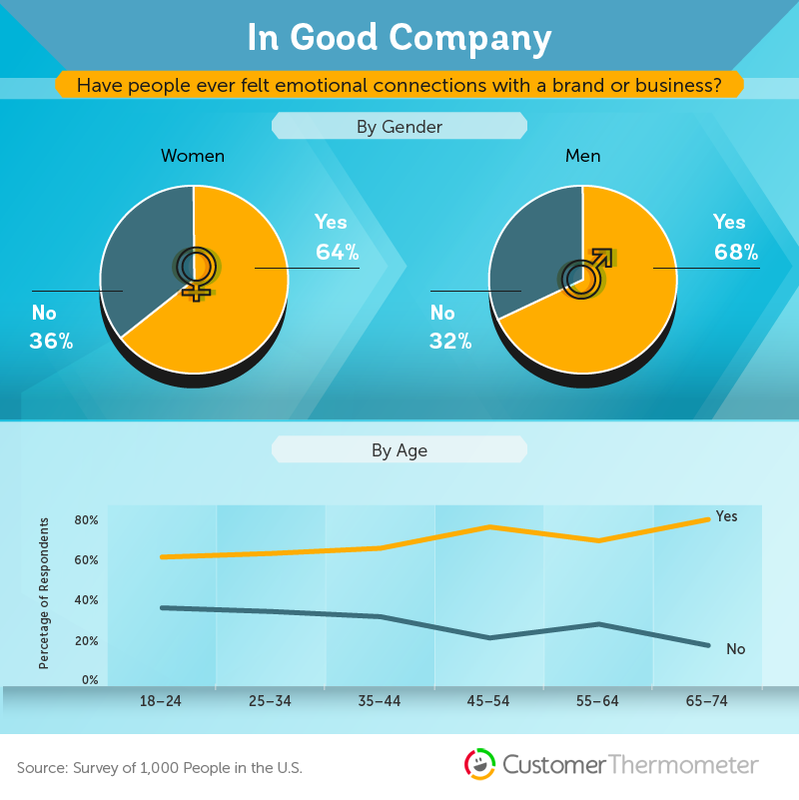 Over 65 percent of the 1,000 people surveyed shared they felt an emotional connection with a brand or business. Overwhelming, the majority of these connections were positive (over 90 percent) across several industries. Less than 10 percent expressed feeling a negative emotional connection with a brand. 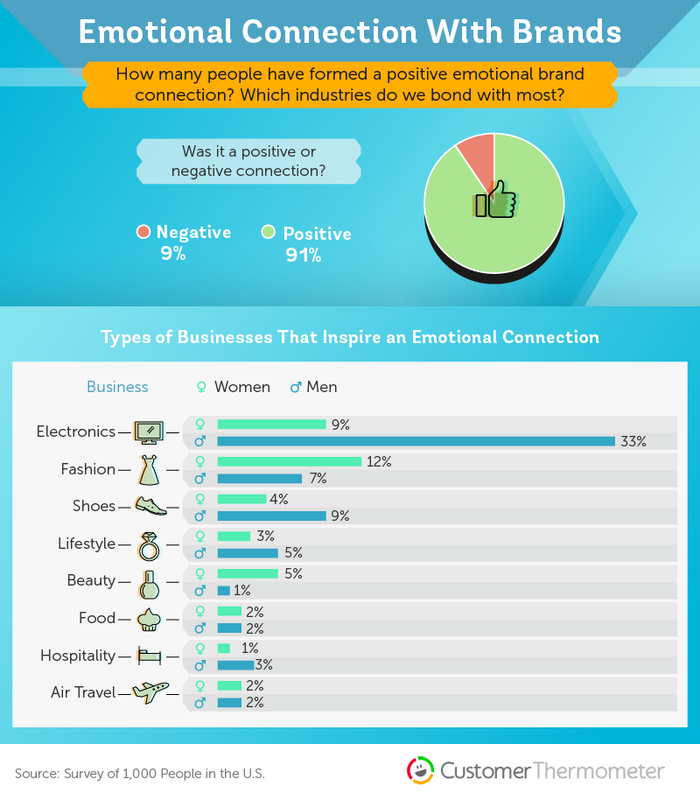 Most men indicated they had an emotional connection with electronics businesses, while the industry women expressed having the largest connection with was fashion. Bucking gender trends and media narratives, more men shared they had an emotional connection with shoes than women. According to Harvard Business Review, customers who have developed a bond with businesses are extremely valuable. They are described as “fully connected customers” and are over 50 percent more valuable, on average, than the highly satisfied customer. These customers are a company’s dream: Individuals who purchase more of your goods and services are less price-sensitive and are focused on your external messaging. Imagine being able to develop these types of connections with more of your customers. Let’s look at what connection you may already be forming, or could be forming, with your clients. Across the board, many felt it wasn’t necessary to have an emotional connection with a brand, ranking the importance of such a 4.2 out of 10. However, while most customers don’t necessarily perceive a need for it, it pays to develop that emotional bond. It’s most likely not going to be an expressed need from your customers, but rather an ability to unlock a feeling inside them where you’ll establish these connections. Further, more than 65 percent of participants shared being emotionally connected to a brand made them feel like the company or business cared about people like them. Our brand loyalty research show this sentiment was almost equal for men and women. In fact, this sense of belonging is identified in Harvard’s research as one of ten significant motivators that profoundly affects customer value. 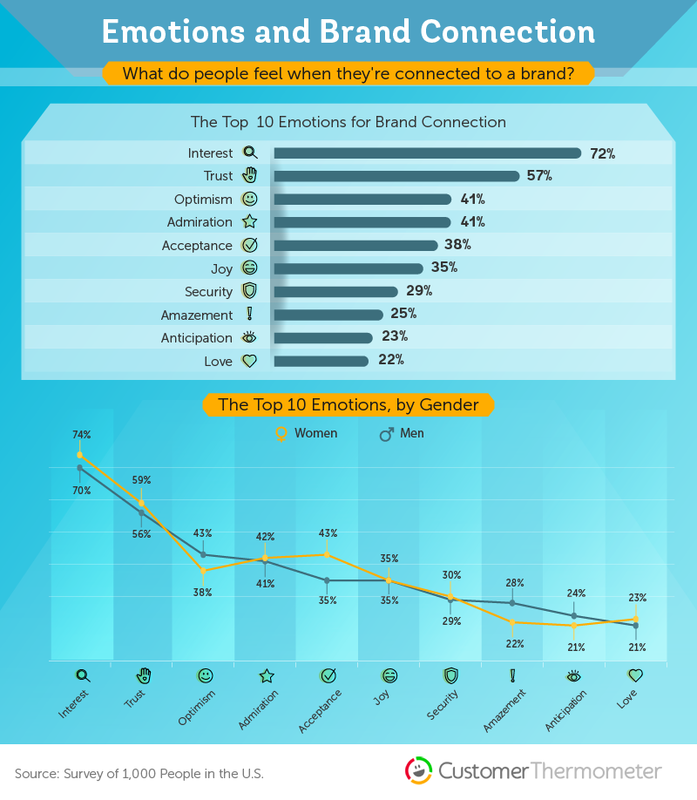 However, while this is the top emotional connection highlighted by consumers, it may not be the one most relevant to your customers. Take time to understand how your customers are connecting with your brand and what message connects with them the most. Emotional connections can happen at any time in a person’s life – and could really come down to a single moment. Or is it something that can be nurtured over decades of using a particular product or service? A majority of men and women have made these connections. Where some variance occurs is in a customer’s age. 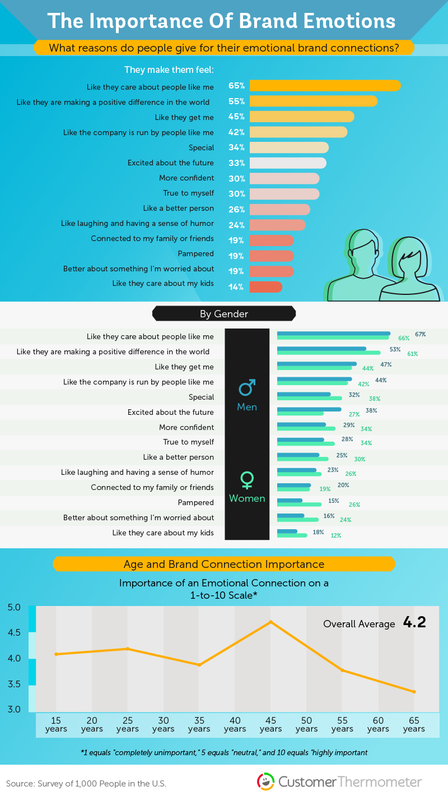 Close to 40 percent of respondents between the ages of 18 and 24 shared they have never felt an emotional connection with a brand or businesses. At the same time, less than 20 percent of those aged 65 to 74 have never developed a connection with a brand or business. Don’t ignore younger consumers, just focus on the messaging that appeals to them. One bank even found a way to inspire a connection with millennials, increasing new accounts by 40 percent and usage by 70 percent. Learn how to capture these by seeking constant feedback to understand your customer’s perception of your brand as you grow. It’s the power of feelings! Interest, more than any other emotion, was felt for a brand by participants (over 70 percent). 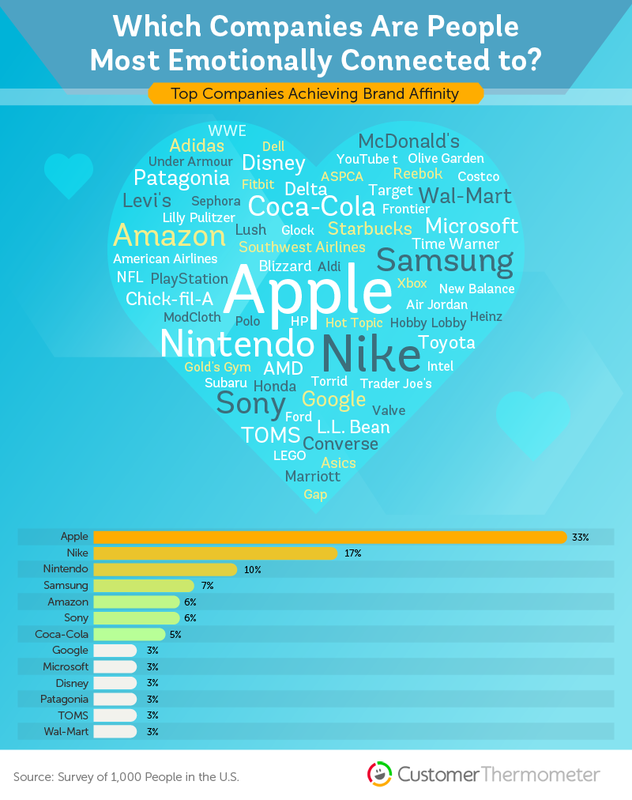 Women, however, felt interest more strongly than men toward these brands by almost 5 percent. The next emotion, felt by 57 percent, was trust. Not only is it imperative to pique consumers’ interest, but also it is important to continually build trust with them. When it comes to harnessing the power of feelings, customer feedback can help businesses achieve the connections customers value most. As Harvard Business Review highlights, customers who are fully connected are less price-sensitive. These are customers who, because of emotional connections, would happily pay for the right to use your products and services. But how much more? If you’re making a positive impact on the world, at least in the eyes of your customers, over 13 percent would pay 31 to 50 percent more for your products and services. People love the idea of companies protecting the environment as well. Over 11 percent would pay between 11 and 15 percent or even 51 percent or more if a company has a green emotional connection. Protecting the environment was one of two key motivators for the aforementioned banking example, where card usage and the creating of new accounts both rose by making an emotional deposit. What are the motivators behind your customer’s engagement with your brand? All you have to do is ask, and they’ll let you know! Should You Take a Stand? Politically charged statements by brands can have a long-lasting impact. While most people – close to 70 percent – have never boycotted a brand due to their political message or stance, the mood is changing. Over 60 percent shared they would, moving forward, boycott a brand that politically offends them. For example, Uber CEO Travis Kalanick removed himself from President Trump’s business advisory council in the wake of customers tweeting #DeleteUber on social media. 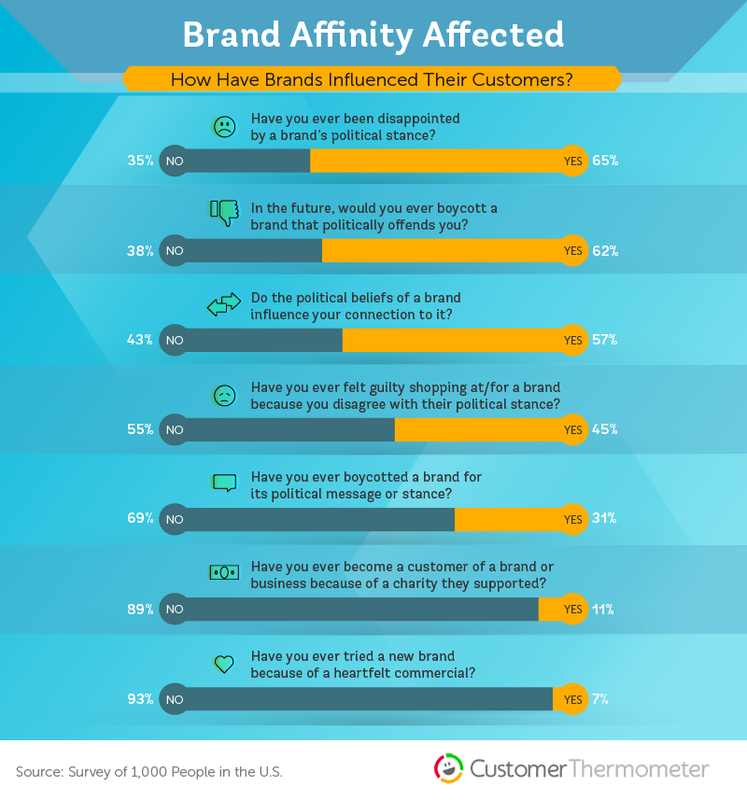 Over 65 percent of people have been disappointed by a brand’s political stance. Brands have a two-customer base to consider – not just their users, but also their employees – when making a decision to traverse political waters. Just be aware of the positive and negative outcomes that may come with your stance. 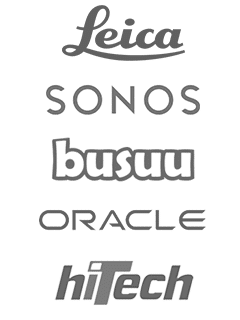 Six of the top 10 brands consumers feel most connected to are from the world of technology. Whether it’s opening a new phone account or playing the newest Mario game, these companies excel at building emotional bonds with their customers. Entertainment, fashion, beverages, and retail made up the rest of the list. Have you been convinced yet of the value of understanding the emotional pull of the services and support or products you sell? While you may have an idea, your customers could probably tell you precisely why they’re buying if asked. 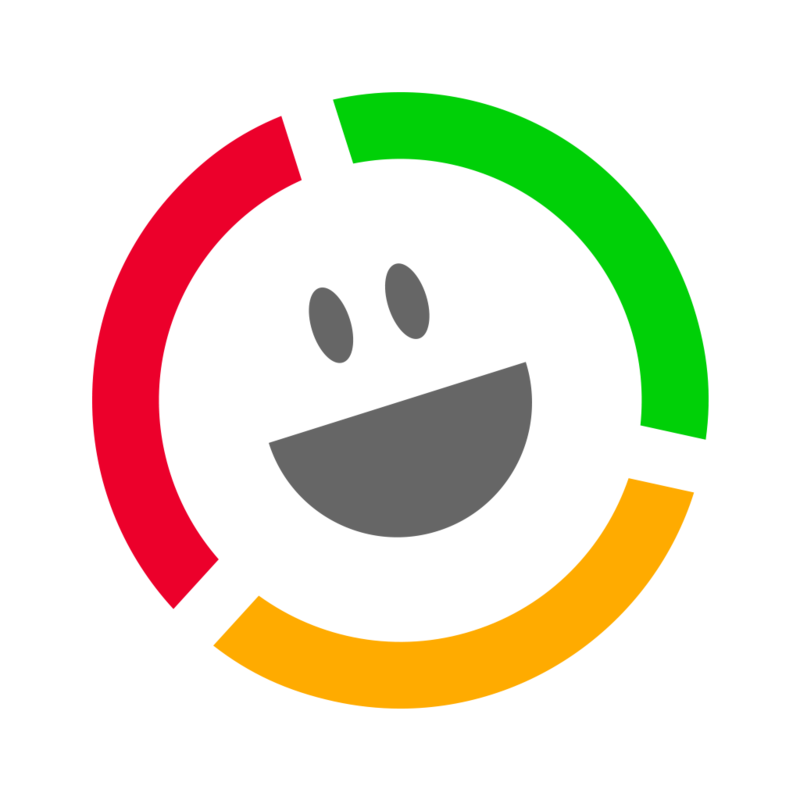 This is where Customer Thermometer comes in – maintaining an emotional connection with a customer over a lifetime is tough. Seek to check in regularly with customers to show them you care, show them you’re interested, and help them trust you and your brand. 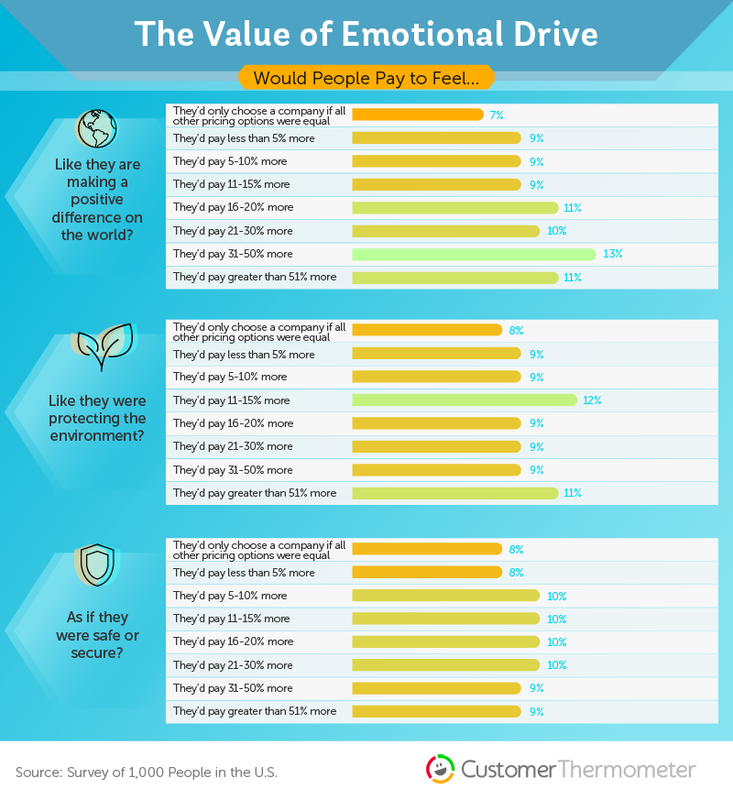 This brand loyalty research surveyed 1,000 Americans about their experiences with being emotionally connected to a business. Feeling connected to this article? Please share the graphics and information as you wish with your own audience for noncommercial use only. Just remember to link back to this page to give the author proper attribution.